Schools Can Win Money for Their Athletic Program and a Visit from the Hulkster! Hulkamania is ready to run wild in a school lucky enough to win the Hulk Hogan’s Main Event Sweepstakes, presented by Majesco Entertainment Company and Channel One News. The sweepstakes, which runs through November 18, asks teens to describe the “main event” in their school. 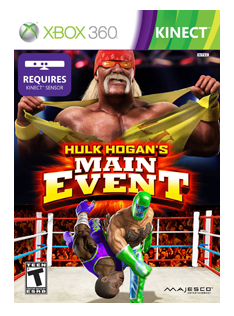 Professional wrestling icon Hulk Hogan will visit the winning school and present a $3,500 check to its athletic department, a Kinect™ for Xbox 360® system, and copies of Hulk Hogan’s Main Event, the first full-body motion-based wrestling video game. Three runners-up will win a Kinect for Xbox 360 bundle, as well as copies of the game that is in stores now. To enter the sweepstakes, visit www.channelone.com/hulk-hogan-sweepstakes. For more information about Hulk Hogan’s Main Event, please visit www.HulkHogansMainEvent.com.